So, its the first day of summer vacation and we’re on our way to Charleston South Carolina and out of the blue….BAMMMM! Tire blows out. Fortunately, we were able to pull right into a shopping center to further assess the situation. While the team changed the tire, we decided to test out BarterScoopLocal.com and put it to a real world test. First thing first, we needed to go to BarterScoopLocal.com on the phone and do a search to see who was in the area to trade with. FYI…this would work anywhere when you get the basics on how to best utilize Barter Scoop directory. Now after calling the Super Broker over there at Bartercard (Jennifer Minchoff) She lined us up with someone who sold tires. Fingers crossed, called him up and told him what we needed and whoala!!! He had the size we needed. Now we needed to line up the rest of the items needed (getting them put on). Tires dropped off…check….tow trucks a towing….check….at the tire shop getting tires put on…..check. While we’re at it, might as well get a oil change and fluids topped of….Just awesome…All on TRADE! Now this was an emergency situation, but could have worked just as easy if it wasn’t. Always think… Barter for Starters and Cash for Last! Use Barter Scoop to search your area to find nearby traders to put a deal together or to simply grab a bite to eat. 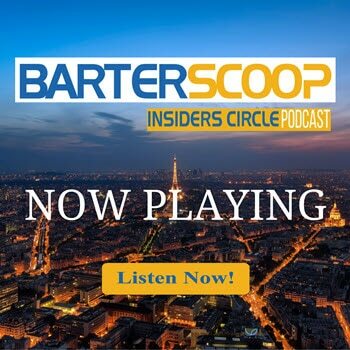 In the coming weeks we’ll have examples from all around the world on how people are using Barter Scoop to find Local Barter Exchanges, Direct Traders, Timebanks, Community Currency Banks and more! Our goal is to help show everyone how you have unlimited potential when you realize that YOUR PERSONAL CURRENCY POSITION is directly related to YOUR LEVEL OF CREATIVITY! Happy Trading….